I'm always usually right ! Although this post’s subject is already “old news”, I have reason to believe that many of you might have missed it , possibly because the media has dealt unfairly with Microsoft. Even though they have reportedly higher earnings than Apple & Google put together and still dominate many markets, they have received significantly less press than the other two companies. Web Services Applications – branded “Windows Live Online“. Desktop Applications – Branded “Windows Live Essentials“. Mobile Application – Branded “Windows Live for Mobile“. Microsoft calls its updates to “Windows Live” products suite “Waves”, and the latest one is “Wave 4”. As I’ve listed above, the suite is divided into three distribution models, but I want to focus on “Windows Live Online” — their suite of web applications. As I’m mostly a mac user today, the other two are much less relevant to me. Perhaps later I’ll do another post about the other two. One other thing before I go on… some features detailed in this post have been around before “wave 4”, but I’m going to present information relevant to the current state of the suite, not just “wave 4”. SkyDrive with Web Office – Online storage with office web applications (Similar to GoogleDocs). Live Spaces – Blogging and personal webpages. Groups – Collaborate with workers or friends. Calendar – Google calendar equivalent. Web Messenger – Allows messenger communication from your browser. Live Home & Live Header – A central access point for all your live services presented as both a homepage and a constant page header. Before I go into detail about these services, I should point out that Microsoft has done a great job of tying them together and thus enhancing one another. For example, SkyDrive (online storage) is used for hosting your photos & videos used with Photos, Profile and Spaces. It also hosts your office documents (web office) and your synced folders. Another example is Messenger integration, which allows direct communications from both your Hotmail inbox, and from all other Windows Live Online Services. 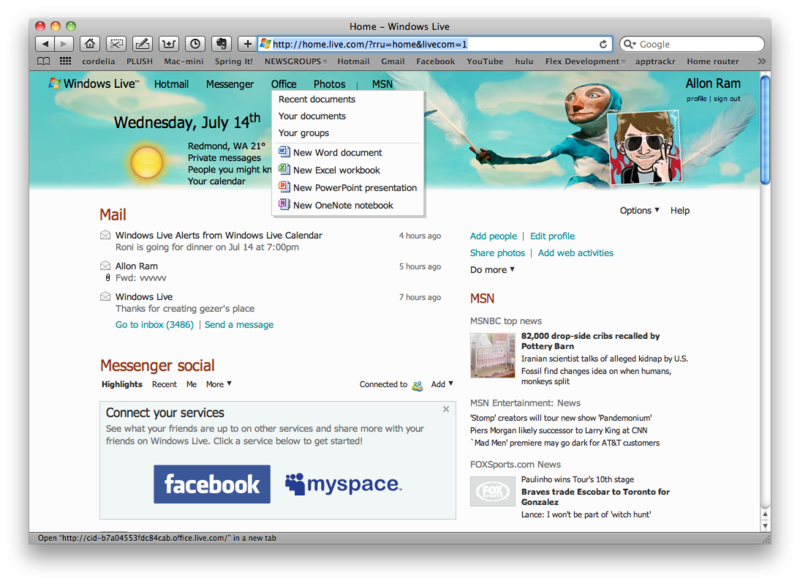 Plus, all the online services have the new Windows Live Header, which provides quick access menus to many features including the web messenger (shown below). SkyDrive is a 25 GB online storage service, where you can store your photos, videos, documents and synced folders (Like DropBox), and access them from any computer and most portable devices. It’s a base service which is integrated with many Live Services that need storage space. The thing I like most about SkyDrive is its integrated office documents web applications editors, which allow you to view and/or edit office documents through your browser (like GoogleDocs). What’s really important about this for us Hebrew speakers is that it works well with Hebrew, allowing both Right-To-Left text direction and Hebrew spell checking, and to top that it works great on Mac with Safari, Firefox or Chrome. There are still some limitations with these web apps, for instance ordered lists do not support Hebrew character lists — only bulleted, numbered or english character lists are available. Still this is a great service, and for many users with basic word docs needs, this can easily replace a desktop office suite or Neo-Office for mac owners such as myself. 2 GB from SkyDrives 25 GB capacity can be used for folder synchronization, a service similar to DropBox and called “Devices”. It will allow you to sync your important files with all your computers. You can also access those files/folders from anywhere using the web application interface. Most of us think that Gmail is the most popular web mail app out there, but actually Hotmail has more users than Gmail or Yahoo-Mail, with 360 million global users as opposed to yahoo’s 284 million and Gmail’s, third place, with 173 million (recent data published by Microsoft). So although Gmail might be leading the Israeli market, and perhaps the US market (I don’t have those figures), globally Hotmail has a strong lead on both. Email Account Integration – Allows you to link multiple email accounts (Gmail, Yahoo etc) to your Hotmail web app so you can access all of them in one place. 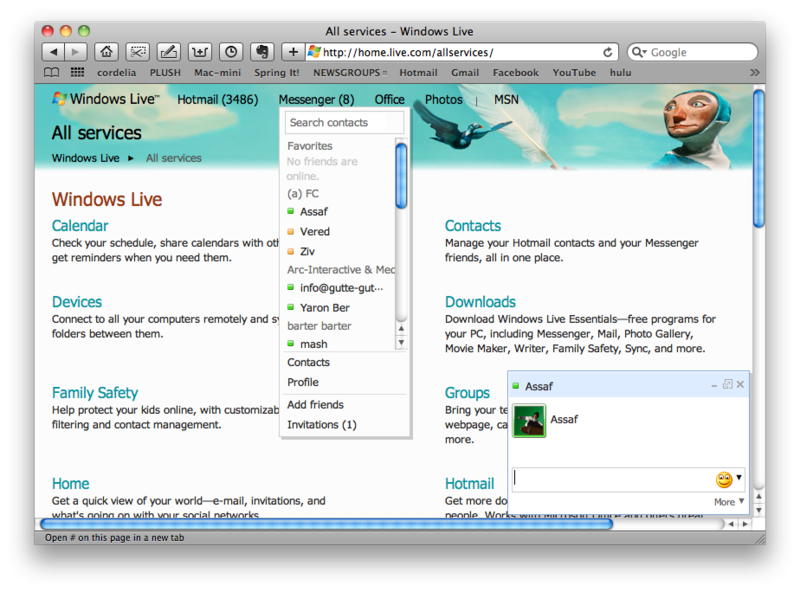 Web IM – Use Web Messenger to chat with your contacts from your Hotmail Web app (works with Mac too). “What’s New” feed – Similar to Facebook’s “News Feed”, the Profile app (social networking) is integrated into both Messenger & Hotmail, so you can easily keep up-to-date with your friends online activities. Web Office Integration – email’s with office documents attachments can be opened directly in Hotmail using the new Web Office applications (Word, Excel, Powerpoint, OneNote). This feature is has limited distribution and might not work yet with your account. A part of Live’s social networking service, it’s like Facebook’s wall. It has your profile details, and allows you to post status messages. It also displays your web activities, so if for example you post a new photo album to the Live Photos Service, it will show up on your profile page. The most interesting feature of the Profile service is its ability to connect all your social web services into it, and thus becomes a central point for your online persona. So you can have all your activities from YouTube, Flickr, Digg, Yelp, LastFM or many others, show up in your Live Profile. For some services, like Facebook for example, it allows bidirectional updates, so that Facebook activities show up on Live Profile, and Live activities show up on Facebook. Basically this service allows you to create a blog page where you can post your thoughts, photos, videos and assortment of widgets and content boxes. It very customizable and theme-able. From what I saw it’s nice, but did not impress me enough to consider using it instead of my WordPress blog. Collaboration service that allows you to create a center for group activities, where you can have discussions, collaborate on documents, share photos and keep everyone up-to-date with a shared email address. It’s of little use for me and as such I haven’t explored this service too much, but perhaps for those who need to collaborate on projects at work, this might be a good solution. What you would expect from a photo’s service, including tagging, slideshows, ordering prints, and sharing. It’s integrated with SkyDrive for its storage space. The one thing I really like about it in comparison to FaceBook photos, is that it allows you to save your photos in their original size, great if you later decide to order prints. Obviously resizing photos is available too. Nothing exciting to report here. Does everything expected, very similar to Google Calendar. A central page for all your Live Services. The Live Header feature which I wrote about earlier is nice, and presents easy access to important features, such as, messenger, Web Office, photos and more. You can change the theme from many nice themes available. For those of you who made it till the end of this post, I applaud you — I know it’s really long and a bit boring, but I thought it’s time to give Microsoft’s big cloud it’s entitled respect. Having said that, I will not switch from Facebook, WordPress, Gmail, DropBox and other services I’m using. 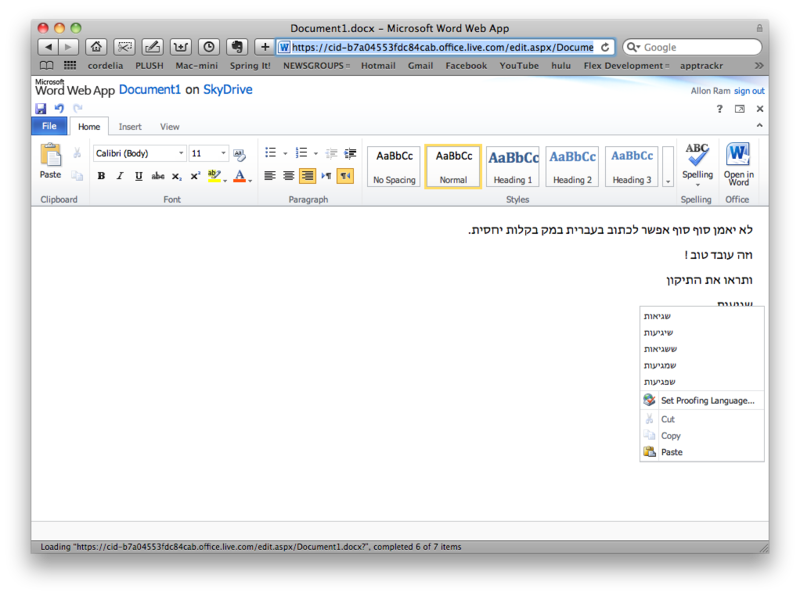 As a Mac user, the one and only service that really got me excited, is the Web Office apps with working hebrew support. I don’t know what can cause me to switch to Live Online Services ? I guess I rather have the best and most popular brands for my various online services, the same way that google BUZZ does nothing for me, nor will Facebook videos replace my YouTube account anytime soon. Nice article at last Microsoft is given a fight. You did not mention if “Devices” worked on all platforms (especially Mac) what I mean is does it have clients for all OS’s (I understand we could view them via internet). Keep up the good job. There is a mac client, but I didn’t work when I tried it. I’ll check it again and update you. Your thoughts & comments are welcome, feel free to contact me ! Move over giganews here comes astraweb and half of my next iPad ! Kickstarter does it again ! iPad 3rd gen coming soon !